Throughout the week I like to spark-up the class with a good poem reading and discussion. 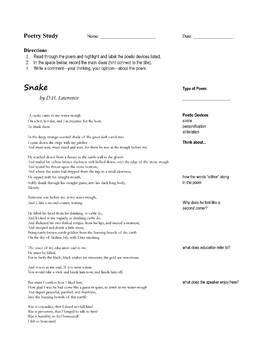 Here is a great poem by D.H. Lawrence about a brief encounter with a snake. Read aloud to your students and ask them to show their thinking with this Guided Response. Teach this poem along other poems by the same author, of the same genre, or of similar theme.